Tiger Woods says he’s not ready to say when he’ll return to competition – although he has already begun “competing” against a couple of US PGA Tour stars. In an update on his website, Woods says that while his practice regimen is still limited to shots 60 yards and in, he has been having putting matches against Rickie Fowler and Justin Thomas at his backyard practice facility in Jupiter Island, Florida. Woods says a crucial test will be an upcoming X-ray taken on his back to see his progress six months after his surgery. 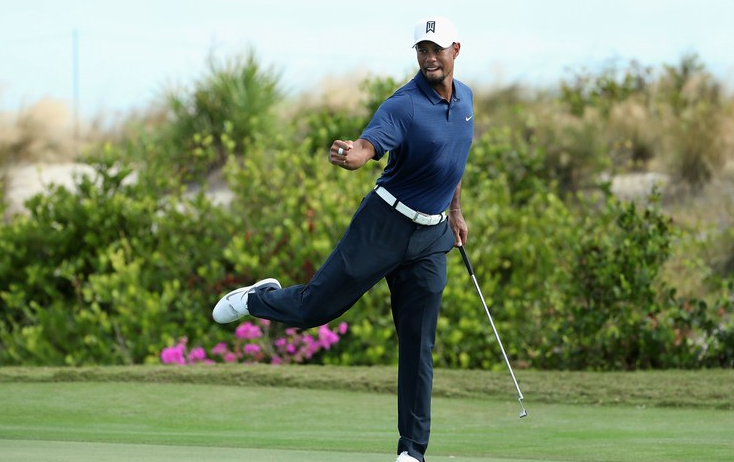 “Once my surgeon takes a look, he’ll give me the parameters of what I can do moving forward,” Woods says. The 14-time Major champion, who will be an assistant captain to buddy Steve Stricker at next week’s Presidents Cup, did say he has begun a more aggressive workout regimen that includes running on a treadmill, biking, swimming and lifting weights twice a day. Most importantly, he says he’s pain free and been sleeping better as a result, although he’s still not in a position to consider a timetable for a return to the PGA Tour. Woods pleaded not guilty last month to driving under the influence over Memorial Day weekend, but is expected to enter a program for first-time offenders. Curiously, Woods in his post made sure to thank his sponsors, who he says have remained steadfast in their support throughout his troubles. Earlier this week, reports surfaced that Woods’ DC-area PGA Tour event, which benefits the Tiger Woods Foundation, is in jeopardy because it does not have a title sponsor.